Classical epistemic logic describes implicit knowledge of agents about facts and knowledge of other agents based on semantic information. The latter is produced by acts of observation or communication that are described well by dynamic epistemic logics. What these logics do not describe, however, is how significant information is also produced by acts of inference—and key axioms of the system merely postulate “deductive closure”. In this paper, we take the view that all information is produced by acts, and hence we also need a dynamic logic of inference steps showing what effort on the part of the agent makes a conclusion explicit knowledge. 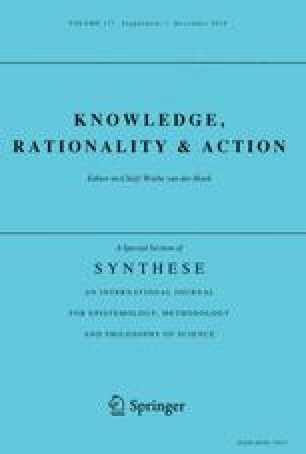 Strong omniscience properties of agents should be seen not as static idealizations, but as the result of dynamic processes that agents engage in. This raises two questions: (a) how to define suitable information states of agents and matching notions of explicit knowledge, (b) how to define natural processes over these states that generate new explicit knowledge. To this end, we use a static base from the existing awareness literature, extending it into a dynamic system that includes traditional acts of observation, but also adding and dropping formulas from the current ‘awareness’ set. We give a completeness theorem, and we show how this dynamics updates explicit knowledge. Then we extend our approach to multi-agent scenarios where awareness changes may happen privately. Finally, we mention further directions and related approaches. Our contribution can be seen as a ‘dynamification’ of existing awareness logics. The authors would like to thank three anonymous referees. Their comments and suggestions have greatly improved this paper.